The political atmosphere in the country is rather disquieting after the arrest of JNU students in response of the incident which occurred on 9th February, 2016 in the prestigious institution called Jawaharlal Nehru University, New Delhi. 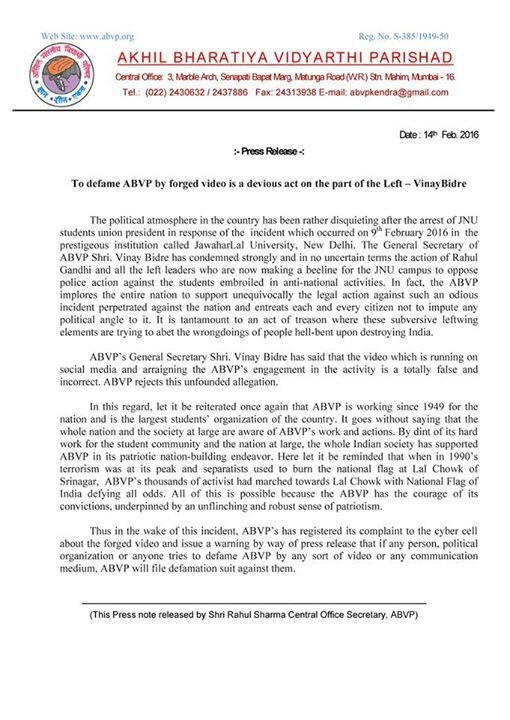 The General Secretary of ABVP, has condemned strongly and in no uncertain terms the action of Rahul Gandhi and all left leaders who are now making a beeline for JNU campus to oppose police action against the student embroiled in anti-national activities. In fact, the ABVP implores the entire nation to support unequivocally the legal action against such an odious incident perpetrated against the nation and entreats each and every citizen not to impose any political angle to it. It is tantamount act to an act of treason where the subversive leftwing elements are trying to abet the wrongdoings of people hell-bent upon destroying India. 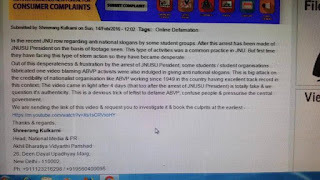 ABVP’s General Secretary Shri Vinay Bidre has said that the video which is running on social media and arraigning the ABVP’s engagement is a totally false and incorrect. 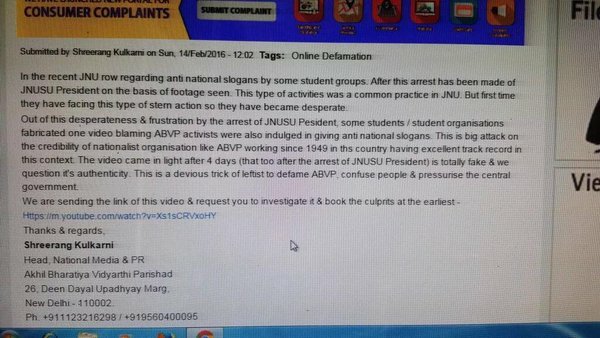 ABVP rejects this unfounded allegation. In this regard, let it be re-iterated once again that ABVP is working since 1949 for the nation and is the largest students’ organization of the country. It goes without saying that the whole nation and the society at large are aware of ABVP’s work and actions. By the dint of its hardwork for the student community and the nation at large, the whole Indian society has supported ABVP in its patriotic nation building endeavor. Here, let it be reminded that when 1990’s terrorism was at its peak and separatists used to burn the national flag at Lal Chowk of Srinagar, ABVP’s thousands of activists had marched towards Lal Chowk with National Flag of India defying all odds. All of this is possible because the ABVP has the courage of its convictions, underpinned by an unflinching and robust sense of patriotism. 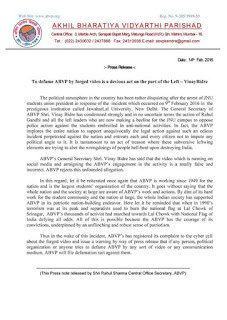 Thus in the wake of this incident, ABVP’s has registered its complaint to the cyber cell about the forged video and issue a warning by way of press release that if any person, political organization or anyone tries to defame ABVP by any sort video or any communicative medium, ABVP will file defamation suit against them. Rashtreeya Swayamsevak Sangh (RSS) strongly condemned the recent demonstration held at JNU of New Delhi in support of terrorist convict Afzal Guru with Anti-India slogans. RSS Akhil Bharatiya Prachar Pramukh Dr Manmoan Vaidya said “Leftist led demo at JNU in support of a terrorist convict with anti Bharat slogans on placards is a matter of grave concern. At the exchequer money, instead of studying students involving in anti Bharat activity & some teachers supporting it is serious. Instead of condemning and demanding strict action against anti-national activities some political leaders are condoning this act”.